Shopaholic's trainer Danny O'Brien feels like the AFL coach in Grand Final week when everything has progressed perfectly. For Shopaholic it is Grand Final time at Eagle Farm tomorrow when she lines up in the Group 1 Tattersall's Tiara over 1400m. O'Brien already has won the Tiara, or the Winter Stakes as it was originally named, with Porto Roca (2001) and Absolut Glam (2008). 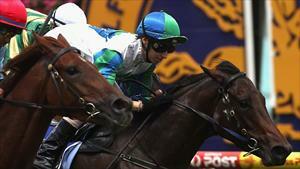 Both came through the AAMI Stradbroke, Porto Roca finishing sixth to Crawl and Absolut Glam fourth to Mr Baritone. In theory the Stradbroke should be the best formline into the Tiara a fortnight later over the same 1400m course at weight-for-age and that notion is reflected in the five runnings since the race was run under WFA conditions with three of the winners having their final lead-up in the Straddie. This year four Tiara hopefuls came through the Stradbroke. They are Mid Summer Music (1st), Sistine Angel (12th), Varenna Miss (10th) and Shopaholic (7th). O'Brien set Shopaholic for the Tiara several months ago and he is totally at ease with all preparation. "This is the race we wanted her to peak and I believe she has," O'Brien said. "Then I wanted a good track and a handy draw and we've got both those. So there should be no excuses." O'Brien can see parallels between Absolut Glam and Shopaholic and was loathe to split them. There is a good form line linking Shopaholic and the other Melbourne filly Soft Sand. The pair clashed in the Group 2 Armanasco Stakes (1400m) at Caulfield on February 25 with Shopaholic getting a good "drop" on Soft Sand in running and going on to a one-length winning margin. O'Brien concedes Shopaholic did have a softer run, but argues the same probably is going to apply this time given Soft Sand has gate 16. Soft Sand's trainer Colin Little is looking forward to the re-match. But Little admits he is using the Tiara as a litmus test on how high to aim this spring. "I really believe Soft Sand is going to become a top class mare next season. But it would be nice to get a Group 1 on her record now," he said. "We rode Soft Sand forward to overcome an awkward draw in the Armanasco and Shopaholic was able to get over the top of us at the finish. This time we'll go back and have the last shot at her."